The Kathmandu valley is considered to be the political, commercial cultural hub in Nepal. The valley is known for its natural beauty and historic, holistic place. The valley once was a separate kingdom containing of three fabled cities-- Kathmandu, Patan and Bhaktapur. Each city is known for artistic exposition of graceful temples, elegant palaces, brick paved courtyards and quaint streets. The valley is surrounded by tier-upon-tier of green mountain walls above which towering of mighty snow capped peaks. The valley is rich in places of pilgrimage for diverse religions, Hindu, Buddhist, Kiranti, Christians among others. All of their deities well side by side by both tantric symbolism and ancient animistic beliefs. A very old Hindu text has described Kathmandu as the land of gods surrounded by beautiful mountain around. It is also said that there were as many temples as there were house and many idols as there were people. In fact Kathmandu boasts one of the largest congregations of magnificent historical monuments and shrines ever built. Kathmandu Durbar Square duly recognized as a world Heritage site by UNESCO this particular area lies in the heart of this city. The locals know this area by its old name ‘Hanuman Dhoka’ palace square, an ancient seat of the Nepalese Royalty. Hanuman Dhoka palace complex consists of a huge royal square exposing a tremendous variety of temples dedicated to different Hindus gods and goddess. Most of the buildings, we can see here dated from 15th to 18th century. Swoyambhunath lies three-kilometer west of Kathmandu city. It is one of the best known Budhhist shrines. It is said to be 2000 years old. It is also known among visitors as a ‘monkey temple’. The main structure of the stupa is made up of brick and clay which supports a lofty conical spire capped by a pinnacle of copper gilt. There are all seeing eyes of Lord Buddha on the four sides of spire. Being situated seventy meter above the level of valley, the hill of Swoyambhunath is a mosaic of small Stupa and pagoda temples. Aside, in front of the temple, one of the famous goddess with the shrine of Ajima called ‘Harati mata’. This temple of goddess believes to be famous in the way of tantric. Both the stupa of Lord Buddha and temple of a goddess are surrounded by other temples and Tibetan monasteries. Being located in the top level of valley, this place is famous for visitors for sightseeing. Pasupatinath temple is one of the famous Hindu temples in the world. The temple is situated 5 kilometer east from the heart of the Kathmandu, on the banks of sacred Bagmati River. Being one of the most important Hindu temples, this is a center of annual pilgrimage. From the time immemorial, the Pasupatinath area contains numerous temples, stupas, monasteries, images and inscriptions. The area is not only a pilgrimage site for the Hindus but also an important cultural treasury for the whole world. However, only Hindus are permitted to enter from the main gate. Bouddhantha Stupa is one of the oldest and the biggest Buddhist monuments ever built in Nepal. Bouddhanath is an imposing structure standing some 36 meters. The Stupa stands on the massive three level Mandala style platform surrounded by colorful private family houses. The basic feature of this great stupa is very much like that of Swoyambhunath stupa except its finial displaying. It is much bigger than Swayambhunath Stupa. This stupa is said to have been built in 5th century AD. 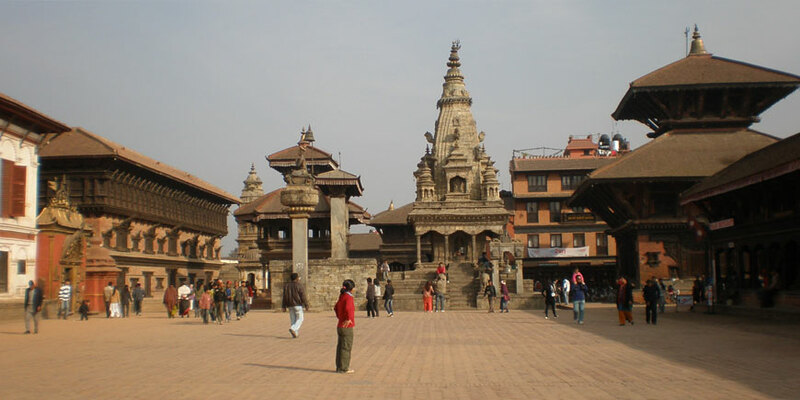 Patan Durbar Square is located on lovely little plateau across the Bagmati. It is situated 7 kilometer southeast of Kathmandu. This city is roughly inhabited by some 1.2 million people. It is considered to be the oldest of city in Kathmandu valley. This city was founded in 3rd century AD. This is known to be the city of fine arts having hundreds of fascinating Hindu and Buddhist monuments scattered in and around. The most important monument no doubt is Patan Durbar Square, recognized by UNESCO as a world heritage site. The square has been described as one of the most picturesque collection of buildings that have been set up so small place by the piety of oriental man. Most of the monuments in this square date back to the medieval Malla period 15th to 17th century, known to be the golden period of Nepalese art and architecture. The important things to be seen in this area include the golden gate and the golden window of the old palace, the beautiful piece of traditional metal crafts, the famed Krishna temple with 21 golden pinnacles, the Royal bath of Sundari chowk, a perfect piece of the classic work in stone. Royal Taleju temple, Viswa Nath temple and Char Narayan temple are the finest examples of the unique craftsmanship in wood; the temple of Bhimsen with the magnificent golden balcony overlooking the square outside plus many other shrines and sculptures scattered in and around the square. Bhaktapur Durbar Square is situated at an altitude of 1,401 meter above sea level. Bhaktapur is very unique and old town in the valley. This city is divided into 24 traditional locality covering an area of 5 square kilometers. Founded by King Anand Dev in 889 AD Bhakatapur is said to have been built in the shape of conch shell a sacred symbol of Lord Vishnu. The word Bhaktapur means the city of devotees. Before the unification of Nepal, Bhaktapur was an independent principality ruled by the Malla Kings, who were very much devoted to religion, culture and art. During the period many magnificent temples and mansions were built. This period is remembered as golden period in the Nepalese art and remains a unique example. Kirtipur is a small but old town lying some eight kilometers southwest of Kathmandu valley on the top off a hill. Tribhuwan University is located at the foot of the hill. This historic town has many things to see such as old shrines and temples, old houses, and people dressed in traditional costume while working on ancient looms. Chobhar is situated some nine kilometers southwest of Kathmandu. This place is famous of its gorge. All the water of the Valley drain flows through it. The legend says that the god Manjushree cut the gorge to drain out Kathmandu Valley which was then a lake. There is a small but picturesque temple of Adinath on the top of a hill. From this point, one has a complete view of snow-capped mountain peaks. Just beyond the Chobhar Gorge. There is the 17th-century temple of Jal Vinayak. The main image of the temple is on a massive rock. Only a small part in front vaguely resembles an elephant's head. The image at Jal Vinayak is different from other images of Lord Ganesh. Shrine of Shekha Narayan is situated between Chobhar and Dakshinkali which represents one of the four Narayans of the Kathmandu Valley. The shrine stands on a hillock beneath a stalactite rock. At the base of Shekha Narayan is a pond with several verities of fish. There are various places around the edge of the Kathmandu Valley offering great mountain views. One of such areas is Nagarkot. Whereby, it does not only provide magnificent views of Himalayas but also the resort village of Nagarkot. It is generally held to be the best mountain watchers make their way up to the village, stay overnight in one of Nagarkot's lodges or hotels than rise at dawn to see the sun appear over the Himalayas. Nagarkot is popular tourist resort of Nepal. It is situated some 32 Kilometers east of Kathmandu at an altitude of 2175m above the sea level. The panorama of the major peaks of eastern Nepal Himalayas including Mt. Everest can be seen from here. Himalayan peaks like Manaslu (8463m) Ganesh Himal (7111m) Langtang (7246m) Gaurishanker (7134m) can also clearly seen from Nagarkot. A motor able road links Nagarkot with Bhaktapur. Manakamana Temple has been not only most visited temple among tourists but also by the Nepalese as the Goddess Manakamana is highly noted as a wishful filling goddess in the country. The holy temple of goddess Manakamana lies on a beautiful ridge west of Kathmandu valley. It is said that she is the younger sister of goddess Kali. She is regarded to be a very sacred goddess. The temple is important from the historical and archeological point of view. It is a famous pilgrimage site for Hindus. Manakamana is four hours walk up hill from the highway. On the occasion of Visit Nepal Year 1998, the cable cars have been plied from Kurintar Village, Chitwan to the hill of Manakamana, which takes only 8 minutes to reach there. Pokhara is second most visited touristic place after Kathmandu valley. The natural and picturesque valley Pokhara is situated at an altitude of 827 meters above the sea level and 200 kilometers west of Kathmandu valley. Prithivi Raj Marga is the highway linked with by Bhairahawa by Siddhartha Raj Marga [Sunauli border]. It is the combination of the long arrays of world famous snow clad peaks, emerald lakes, turbulent rivers with deep Georges and picturesque villages inhabited by Magar, Gurungs and Thakalis. Pokhara offers the magnificent views of Dhaulagiri, Manaslu, Machhapuchhare, five peaks of Annapurna Himalayas and others. Pokhara numerous lakes known as ‘Tal’ in Nepali offers various exciting activities namely fishing, boating and swimming, which ensure the famous Phewa, Begnas and Rupa lakes of Pokhara. Pokhara is also referred as the center of adventure. It is the starting point for most of the popular trekking & rafting destination. The serenity of Phewa lake and the magnificence of Machhapuchhare (6,977m) rising behind it, creates an ambiance of peace and magic. Phewa lake is situated at an altitude of 784m above sea level with an island temple at the middle of the lake. It is second largest lake in the kingdom. Temple situated at the island is the two storied pagoda dedicated to the boar magnification of Ajima. The reflection of Mt. Machhapuchhare & Annapurna can be seen in its serene water. Thick forest lies on the adjoining southern slopes of the lake. Both the Begnas and Rupa Lake lie in the north-east of the Pokhara valley at the distance of 13kms from the main city. These lakes are locates at the foothill of Begnas, mountain and are separated by the Pachabiya hill. Seti River Gorges, carved by Seti-Gandaki is one of the natural wonder of Pokhara. K.I. Singh bridge at Bagar, Mahendrapool and Prithivi highway bridge near bus park, provides a perfect view of the river's dreadful rush and the deep gorge made by the turbulent flow of white water. Davi's fall, locally known as Patale Chhango in the southern flank of the Pokhara valley is where the stream flowing from Fewa lake collapses and surges down the rock into a deep gage, leaping through several potholes. One museum displays the life styles and history of the Gurungs, Thakalis and Tharu and other one Natural history museum and is functioned by the Annapurna Conservation area project. Butterflies, insects, birds and wild life found in the Annapurna region. Spectacular Panorama of the Annapurna range forms the backdrop of Pokhara valley. The mountains stretching from east to west includes Annapurna I to IV. It lies at the distance of 40kms from the valley and at the elevation of 900m. Annapurna I (8.091m high is the highest peak. Mt. Machhapuchhare with its pyramid shape dominated all the other neighboring Peaks. The other peaks are Mt. Dhaulagiri 8167m, Lamjung Himal 6983m and Manaslu 8163m and Himalchuli. This is the most famous religious monument in Pokhara. Built almost in the middle of Phewa Lake, this two-storied pagoda is dedicated to the boar manifestation of Ajima, the protector deity representing the female force Shakti. Devotees can be seen, especially on Saturday, carrying male animals and fowl across the lake to be sacrificed to the deity. Pony treks, is becoming more popular trekking routs in recent days because of it landscape varying from the even lakeside to small hills with the most famous view in the country. Pokhara provides a magnificent opportunity for sightseeing on horseback. Lumbini is the birth place of Lord Buddha, the apostle of peace and compassion. It is situate some 21 km west of Bhairahawa and 285 km south-west of Kathmandu. It is the place of pilgrimage for Buddhist as well as place of reverence for peace lovers of any religious faith throughout the world. The central attraction at Lumbinin is the sacred garden with Maya Devi temple depicting the birth of Lord Buddha, Ashoka Pillar pinpointing the birth place of Buddha and Shakya Tank where Maya Devi, the mother of Lord Buddha, is supposed to have taken a dip before bringing forth the baby - Lord Buddha. Around this holy site, there are remnants of monasteries and Chaityas built over the centuries following Buddha's birth in 632 BC. Currently the work around the Lumbini is underway to transform three square miles of flat, empty land into an expression of Buddha's peace and compassion creating a sculpted landscape to make the teaching of Lord Buddha accessible to all humanities. The project area designed on a north-south axis encompasses three zones, each covering one square mile. The Lumbini village lies as a gateway to the outer world. The second zone, on either side of a canal and walkway will be developed into a monastic enclave where nations, institutions and organization can build places of worship that reflect varying religious ideals and styles. A meditation center will be the highlight of this zone. The third and most important zone is the sacred garden itself where the beauty of its plant life will be restored to create a reverent atmosphere in which one can experience Buddha's universal message. Kakani is located 29 km north-west of Kathmandu at an altitude of 1,982 m above the sea level. It is famous for the magnificent views over Kathmandu Valley and the north-western Himalayas ranges against the vastness of the sky. The fabulous area of Kakani features attractions ranging from beautiful alpine scenery to the magnificent Himalayan Panorama particularly the Ganesh Himal massif. A close view of the other peak of Himalayas which can be seen from here are Gaurishanker (7134 in), Choba Bhamte (6016 in), Dorje Lakpa, Manaslu (8163 in), Himalchuli (7893 in), Annapurna (8091 m) and the other several peaks. A majestic view of the sunset can also be seen from this place. A trip to Kakani along the beautiful highway of Trishuli road is scenically rewarding with green forest and mountains grandeur in one direction and fertile river flats and terraces cultivation on the other. This road begins from Balaju and terminates at Kaule from where the road bifurcates. Dhulikhel is an ancient town located at 30 km east of Kathmandu along the Kathmandu - Kodari or Arniko Highway (way to Tibet). It is famous for its scenic beauty and tradition-- a lovely place. From this place, one can have a complete panoramic view of the snowy ranges of the Annapurna range, Langtang, Choba Bhamre, Gaurishanker, Number Karyolung among others. From Dhulikhel you also can have a good view of the sunrise. Namobuddha is situated on the hill above Panauti. It is especially famed for hiking and meditation. Whereby situated of Buddhist monastery called ‘Namobuddha’. There is an amazing story concerning Buddha being commemorated by an ancient stone slab and a stupa with the all seeing eyes of Lord Buddha. It is an ideal place for in meditation. It is located about two and a half hours north of Dhulikhel on foot, near the tops of jungle ridge. During February-March Tibetans and Bhotias arrive here for praying. A trial leads up to a bigger Tibetan gompa on the top the hill of the Namo Buddha. According to the fable Buddha, in one of his previous lives as a hunter, encountered a starving tigress and her cubs here, and moved by compassion, offered his own flesh to her, a sacrifice that helped pave the way for his eventual rebirth as the historical Buddha. The stupa is supposed to contain the hunter's bones and hair. Palanchowk Bhagwati is situated over the hill overlooking the valley of Panchkhal 40 km north-east of the Kathmandu city. This temple is said to have been constructed during the reign of King Man Dev. The temple houses a-3 feet long beautiful artistic idol of Goddess Bhagwati carved in a black stone. Panauti is located between the Punyamata and Roshi streams. Panauti is formed of the shape of a triangle with a serpent (Naga) idol standing at each of its three corners to protect from floods. Pride of this place goes to the massive, three-tired Indreshwor Mahadev, believed to have constructed in 1294 AD. The shrine area at the sacred confluence called the Khware', is one of those tranquil spots that can way lay a dreamer for hours. The large 'battal', a favorite hang-out for the local pensioners depicting scenes from Hindu and some Buddhist mythology, vishnu in cosmic deep, Rama killing the ten-headed demon-king Ravana and even Krishna being chased up a tree by a pack of naked Gopis (milkmaids). Janakpur is one of the another greatest religious place, famous as the birth place of Goddess Sita, the consort of Lord Rama and the heroine of great Hindu epic, the RAMAYANA. There is an artistic marble temple of Sita (known as Janaki) which is popularly known as Naulakha Mandir whereby, the religious festivals, pilgrimages trade fairs and other festivities are held especially on the occasion of Bivaha Panchami and Ram Navami.